A few posts ago, I advocated along with my friend Stefanie Lightman of iFridge & Company that the all important project/team leader role would be better served if referred to as the “bus driver”. Why? Because the complexity and importance of the role is more easily understood when packaged in a meaningful and metaphorical name like the “bus driver”. I now have a second role renaming proposal. If you are the CMO or xVP of Marketing, you shall now be called the VP of Names. Why the VP of Names? The CMO or xVP of Marketing is senior marketing leader in the organization. Their job is to connect, at the deepest emotional level possible (affordable), the value proposition of the company’s offering to the customer. Those connections occur and can only be remembered using powerful language that is backed by the customer’s real-life experience. Those experiences are strengthened or eroded at every customer touch point – using the offering and interacting with the company at their website, in their lobby, listening to a voicemail greeting, talking to an account or service rep, and many more. Your language and words must be portable enough to work in all these contexts. In technology businesses, it is challenging to describe highly complex solutions to highly complex problems. That challenge is met by the VP of Names who must describe that complexity and and differentiation with easy to consume yet powerful words, metaphors, and visuals. Great names provide the shorthand required for increasingly efficient and engaging conversations. Names might be internal only project or code-names, or external for customers as well. Great names will grow to represent initiatives and rally cries for a small team or inspire an entire global organization. “Rip and replace” are three very powerful words to describe an IT scenario of one product displacing another. Its used a lot in salesmanship, especially by incumbent vendors justifying their current deployed solutions while staking claim to an adjacent position. “Candy and Aspirin”, “Do Things Better – Do Better Things”, “Tastes Great – Less Filling” and “Top and Bottom Line” are all phrases that articulate unexpected benefits on two opposite sides. Candy and Aspirin became such a strong internal rally cry at Open Text, it inspired colleague Cheryl McKinnon to name her blog as such. How much quality thought do you put into project names? A client last year launched Project Giraffe as their ongoing 3-year strategic planning initiative. The name says it all – you really don’t need any further description. 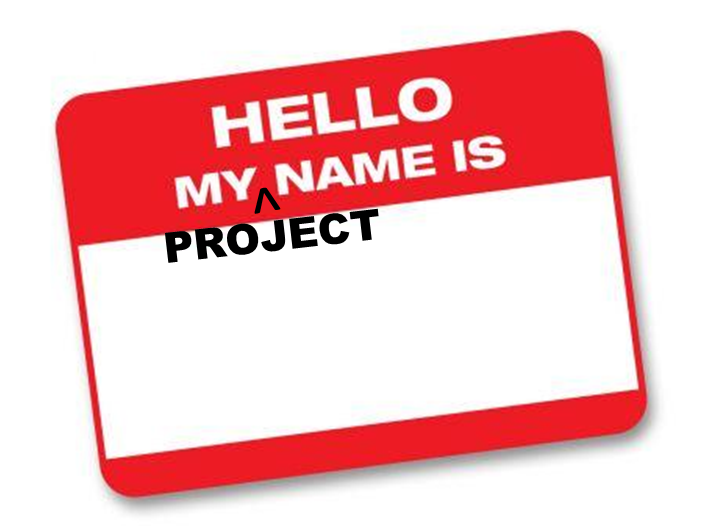 Put quality thought into your naming, especially internal project names as those lay the foundation for your external execution. Do that well, and maybe someday you’ll apply to be a VP of Names!